Timing belts are vital to the operation of your vehicle. Make sure that you get your vehicle’s timing belt replaced when recommended for your model/year. Once the timing belt is broken it can be a very costly repair. There are multiple factors in extending the life of a vehicle and a properly maintained and replaced timing belt is one of them. We can help you determine if your timing belt replacement is needed. We offer fast and reliable service on many makes and models! Our certified technicians will make sure you drive away with confidence in no time. Timing belt replacement for most makes and models starting from $999.95, includes timing belt, tensioners, rollers, and a coolant flush. Take advantage of our very special offer! 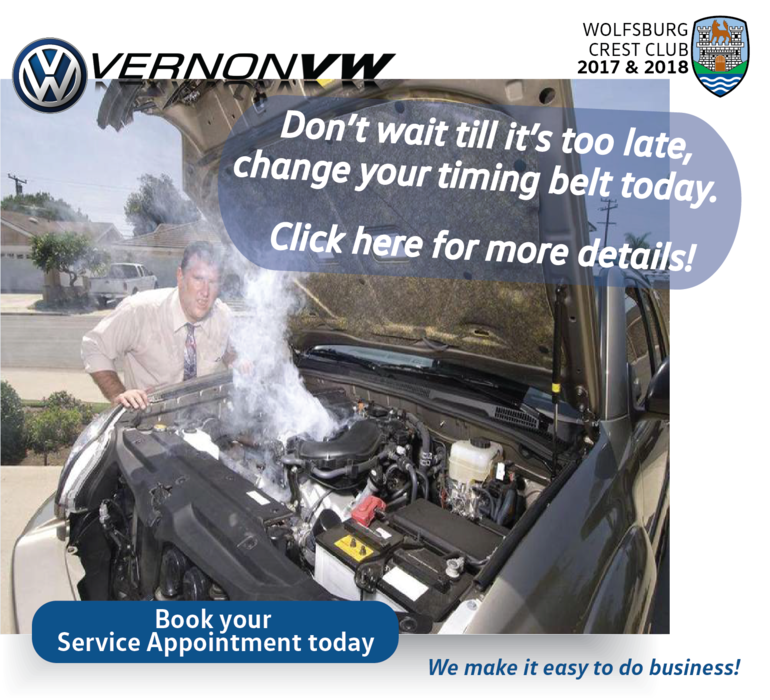 Vernon Volkswagen offers the timing belt replacement for only $999.95 + taxes! Trust only in Volkswagen Original Parts! Don't wait! Book your appointment today!